Welcome to a new level of PC performance with G.SKILL Ripjaws Series memory. Your computer will never be the same with 4GB of high-density DDR3 1333 SDRAM spread over two DIMMs. Eliminate data bottlenecks by taking advantage of multi-channel technology and multiplying your memory bandwidth. Ripjaws Series memory is designed specifically to complement Core i7 processors and the X58 Express Chipset. Optimized for speed, low latency and high stability, Ripjaws Series memory is the perfect solution to faster programs and quicker load times. Heat management is always important for any PC builder and enthusiast. G.SKILL understands this concern, which is why each Ripjaws Series DIMM comes with a stylish comb-like design heat-spreader, which dissipates heat by exposing it to cool air over a greater surface area and will look great in any case. These DIMMs also operate at a cool 1.5V for better internal temperatures and overclocking versatility. Upgrade your PC with raw power and own G.SKILL Ripjaws Series memory today! DDR3 1333 Reaching the optimal balance between the sheer speed of DDR3 and excellent latency, the G.SKILL Ripjaws Series DDR3 SDRAM is rated at 1333MHz 8-8-8-21 to meet the rigorous requirements of the most fanatic gamers and enthusiasts. Effective Heat Spreader The high-performance heat spreader effectively dissipates heat from memory module to ensure system stability even in the most extremely overclocked memory module. Pros: I bought this in 2011 and now it's 2017, I was looking for information on it for my records and here it is still being sold. I have had absolutely no problems with this. I bought two of these dual kits and I have 8g memory. I do not leave my computer run , I have turned it off and on at least twice a day since I built it in 2011. Even I was surprised that I have had it this long! The reason for updating my info on my components is that I am considering getting a new board ( nothing wrong with the old one) because it's all getting old. So I found a new board that would work with my CPU and could run a newer version CPU also and I wanted to see if this memory would work with it. The new board an ASRock has USB 3.1 and some other good features. Other Thoughts: I just don't see how you can go wrong with this memory, but I would (as I did) check your board manufactures site for recommended memory! Pros: Installed on an upgrade job. I used an AMD 965 Phenom Black box on an ASUS M4A89GTD PRO/USB3 AM3 Motherboard. Worked perfectly right of the bat. Bought 06/12. Still going strong ! Pros: Thank you for your G.Skill purchase and review. Glad to hear the RAM works great in your system. This is a great memory kit as it provides above average performance at a low price. The low latency allows the memory to respond quickly to the CPU, so it is perfect for basic computing and gaming. 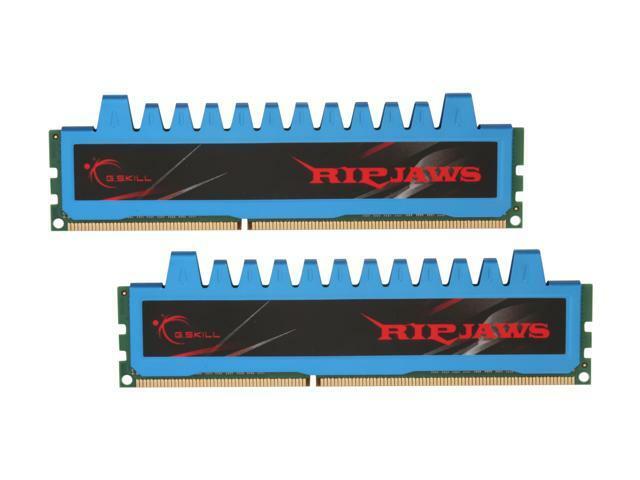 The G.Skill RipJaws series is one of the best selling RAM on NewEgg. For any further questions or concerns, please feel free to contact us directly. Pros: Purchased to upgrade the RAM in my home HTPC (theatre PC), which, if you can believe it, was only at 2GB before. Worked great and solved all the issues with my operating system. Pros: I bought a set in April 2010 when I built my last rig. Everything fired right up and I've never had any issues. I still like the color and design of this set. Cons: None really. I paid $110 back then which is expensive compared to today's price. Pros: Fast Ram. Cheap Ram. G.Skill teaches your granny to cook eggs. Cons: One stick JUST died after 7 years, of near continual operation as I never turn off my systems. As for a NewEgg con directly, I don't see anywhere, where you can just buy ONE. Oh well. I'll get 2 more and keep my current one as a spare. Other Thoughts: Just because one of mine died after a long operation time, does not mean your sticks will. For the price and OC performance (never oc'd) I don't think many things can top it. I've had other "quality" ram (kston, patriot) die on me sooner. As a warranty tech, there is just no way to tell if and when something will go. This stuff, is all a mind of it's own I swear. Glad to hear G.Skill RAM has been working fast in your system for 7 straight years. The RipJaws series is one of the most popular on Newegg for it's high quality and low price. Also, don't forget all G.Skill memory kits are backed by a manufacturer lifetime warranty. If a module is defective, send it in for RMA exchange and we can send you new replacements right away. Visit the G.Skill website for complete RMA procedure. WIth G.Skill, you are guaranteed good working memory for life. For any further questions or concerns, please feel free to contact us directly. Other Thoughts: I bought these in 2010. I'm writing this in 2015, several mother boards later. They work perfectly.